Born and raised in New York City, Joshua White studied theater and design at Carnegie Tech (now Carnegie Mellon University) and filmmaking at the University of Southern California. After college, he returned to New York and became interested in multimedia, especially creating lighting and slide shows. Soon thereafter he started designing environments for the first generation of NY discotheques. In 1967, he founded the Joshua Light Show, a group of artists improvising with projections in live concert venues. While much of their work was created for classical music and jazz performances, a major turning point came with the opening of Bill Graham’s Fillmore East on the Lower East Side of Manhattan in the spring of 1968. The Joshua Light Show were resident artists at Fillmore East and performed live behind all the major musical artists of the time: Frank Zappa, Janis Joplin, The Grateful Dead, The Doors, The Who, Jefferson Airplane, and Jimi Hendrix. They also performed at Lincoln Center, Carnegie Hall, Tanglewood, and other major music venues in New York. During this same period, JLS toured Europe and created the legendary party scene for John Schlesinger’s Academy Award winning film Midnight Cowboy. After performing at Woodstock and observing the explosive growth of audiences for popular music, White invented Joshua Television, an electronic light show using large screen video projection. Then, as network television discovered rock and roll, White segued into a full-time television directing career. For thirty years thereafter, White worked as producer and director on an eclectic range of shows such as Seinfeld, The Jerry Lewis Telethon, The Max Headroom Show, Club MTV, New York Philharmonic Young Peoples Concerts, and Inside the Actors Studio. He received an Emmy nomination for an ABC special on Cat Stevens. In addition, White continued to work with art and artists; he directed Laurie Anderson’s video to “O Superman,” designed lighting effects for the film, The Rose, and staged the first rock concert ever at Radio City Music Hall. In recent years, the Joshua Light Show has received renewed attention in the art world. White collaborated with artist Gary Panter to recreate aspects of his legendary light shows at The Anthology Film Archives (2004), which has led to many more collaborations, including installations at Museum of Contemporary Art Detroit (2012) and ArtSpace, a permanent installation for the Taubman Museum in Roanoke, VA (2009). 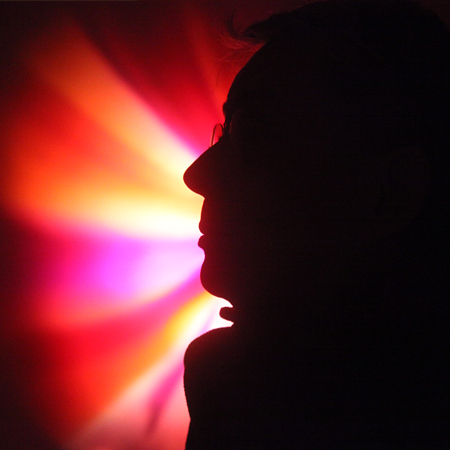 Joshua Light Show was featured in the exhibition, Visual Music: Synesthesia in Art and Music Since 1900, organized by the Hirshhorn Museum, Washington D.C., (2005), which also toured to the Museum of Contemporary Art, Los Angeles. In 2006, the Tate Museum/Liverpool included the Joshua Light Show in their Summer of Love exhibition, which toured throughout Europe and in the summer of 2008 was on view at the Whitney Museum of American Art, New York. For over 15 years, Joshua has enjoyed a collaboration with the artist Michael Smith. They met in 1988 and started working together on Mike’s Kiddie Show (1990) and Doug and Mike’s Adult Entertainment (1991), both of which White directed. In 1997, White and Smith created MUS-CO: 1969-1997 at the Lauren Wittels Gallery in New York. Since then, the two artists have jointly created Open House (1999), The QuinQuag Arts and Wellness Centre Touring Exhibition (2001), Take Off Your Pants! (2005), and the design for the large exhibition, Mike’s World which originated at the Blanton Museum in Austin, TX and moved to The ICA Gallery in Philadelphia.